RPM has done several boxing's of the complete FT-17 over the years. I bought my kit years ago at my local hobby shop that went out of business. The Renault FT (frequently referred to in post-World War I literature as the FT-17, FT17, or similar) was a French light tank that was among the most revolutionary and influential tank designs in history. The FT was the first production tank to have its armament within a fully rotating turret. The Renault FT's configuration – crew compartment at the front, engine compartment at the back, and main armament in a revolving turret – became and remains the standard tank layout. As such, some historians of armored warfare have called the Renault FT the world's first modern tank. Over 3,000 Renault FT tanks were manufactured by French industry, most of them during 1918. Another 950 of an almost identical licensed copy of the FT (the M1917) were made in the United States, but not in time to enter combat. RPM is a model company based in Warsaw, Poland. This kit came in a flimsy oversized end-opening box. It is 5" too long and 2" too wide. My box is badly crushed too. The box art shows a black and white line drawing side-view and an illustration of the links. 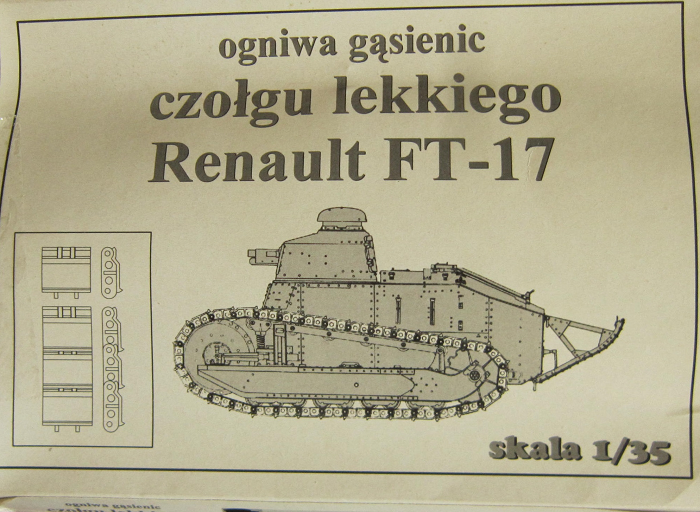 One side panel has info about the kit in German, English and Polish and "Model suitable for ages 10 to adult. Contains instructions for assembly. Paint and cement not included and RPM's address and phone number in Warsaw, Poland. 1. A German Light Tank's seperate track links set for the Panzer. I, Panzer II, Wespe, Marder III, Maultier and Panzerwerfer 42. 2. 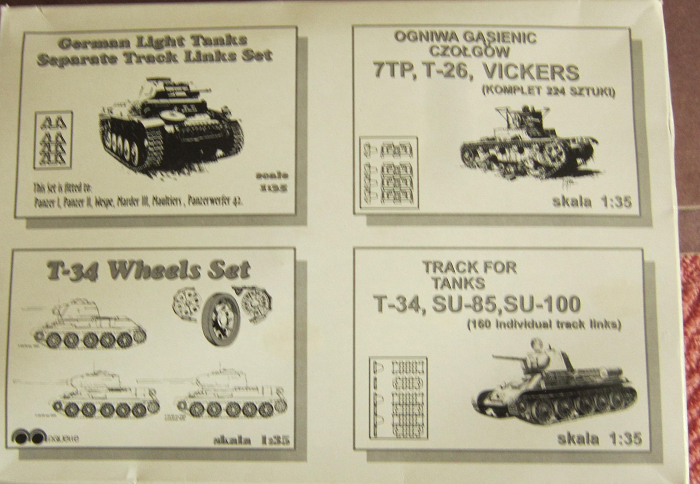 Individual Track Links for 7TP, T-26 & Vickers. 4. 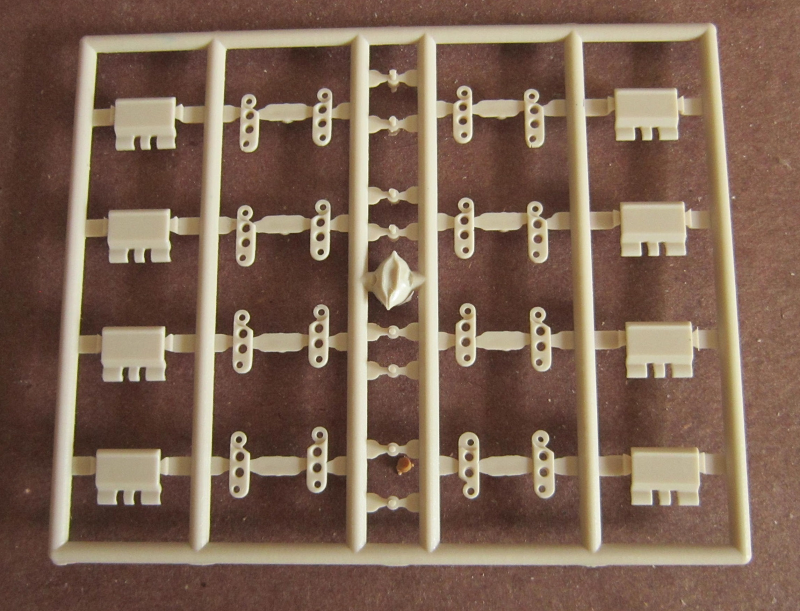 Individual Track links for T-34, SU-85 & SU-100. This kit contains 8 identical pale-gray parts trees in a sealed clear cello bag and the instructions. There are 8 individual links per tree. There are 32 parts on per tree and the moldings are clean and well done. Each tree has 4 track pads,16 links and 8 connecting rollers. The instruction sheet is 1 page. 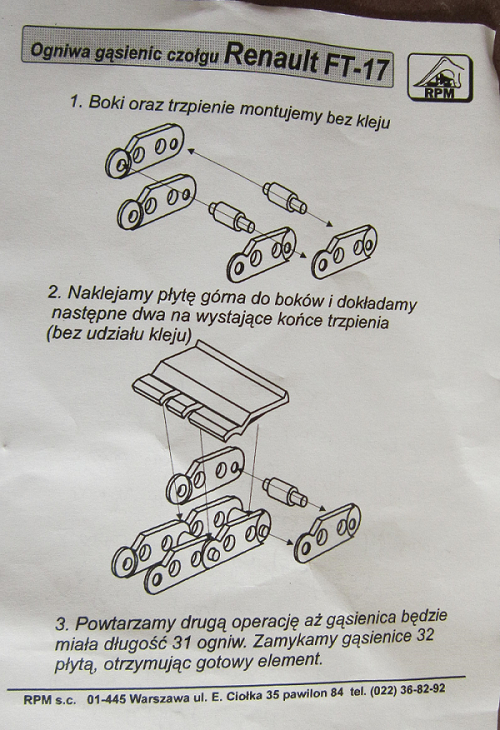 It is written in Polish but the drawings explain assembling of the track links very well and should not pose a problem for an experienced modeler.